A conductor is a substance which conducts electricity but is not chemically changed during the conduction. Electrolytes are compounds that can conduct electricity in molten or aqueous solution. Examples of electrolytes are acids, alkalis and salts dissolved in water or molten salts. All these are ionic substances. A non-electrolyte is a liquid which does not allow the passage of electricity. Examples of non-electrolytes, weak electrolytes and strong electrolytes. Most of the electrolytes are wither liquid (molten) ionic compounds or the aqueous solution of ionic compounds. Figure below shows the arrangement of ions of solid sodium chloride, molten sodium chloride and aqueous solution of sodium chloride. In solid, the ions are not free to move whereas in liquid (molten) and in aqueous solution, the ions can move freely. Q: Explain why solid ionic substances do not conduct electricity. In solid ionic substances, the ions are held together in fixed positions by strong forces. There are no free moving charge particles presences in solid ionic substances. Q: Explain why molten sodium chloride can conduct electricity while molten naphthalene cannot? Sodium chloride is an ionic compound. 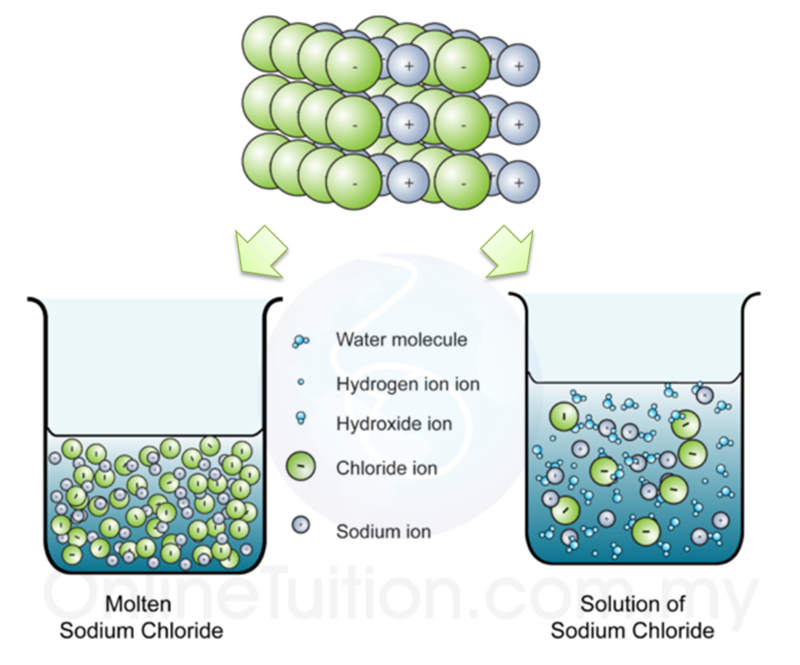 Molten sodium chloride can conduct electricity because of the presence of the free moving ions in the liquid. Naphthalene is a covalent compound. It does not contain any ions. Therefore, molten naphthalene cannot conduct electricity. Most covalent compounds are non-electrolyte. However, some covalent compound such as hydrogen chloride and ammonia are electrolyte because they react with water to produce ions. In electrolytic cell, electric current is flowed through an electrolyte to produce a chemical reaction. Electrical energy is converted to chemical energy, and the process is called electrolysis. In voltaic cell, chemical is used to produce electricity. In this cell, chemical energy is converted to electrical energy. Heard you the first time. Lol!